I think design plays a part in achieving these goals. Our built environment directly impacts how we function and how we feel. Over the past 2 weeks I had the opportunity to travel to Europe, specifically Belgium, the Netherlands and Germany. While in Rotterdam I stayed in an apartment-style hotel. It was a lovely, bright and modern suite; about 500 sf in size. For my husband and I, it offered all the amenities we needed; a kitchen-dining area, a closet for laundry & utilities, a living room, a corner for the bed with a substantial closet and even a split bathroom (sink and shower in one room and toilet & second sink in the other.) I began to think about what it would be like to live in a space this size on a permanent basis (maybe once the kids move out). What would a space of this size and efficiency mean to our daily lives? Would it allow us to work less and travel more? A smaller space would mean a smaller mortgage, lower monthly utilities, less maintenance costs and reduced taxes. Would it allow us to free up time in the evenings and weekends? A smaller foot print would mean less to clean. Putting away “stuff” would be minimal since room for extra “stuff” simply wouldn’t exist. And wouldn’t less ‘stuff ‘offer more room to breathe instead suffocating under the weight of it all? A direct result might be the purchasing of fewer, quality items rather than mounds of disposable crap. Would it encourage us to be more social? A tiny living space could get claustrophobic after a while, so going out with friends and experiencing the world around us would be necessary. Sharing common resources and space might even be a thought. What if numerous ‘tiny space dwellers’ owned a common green space and shared the duties of maintaining it? One lawn mower, one weed-wacker and one snow shovel….take turns….a fraction of the work and cost. Maybe the children of these families would spend endless hours playing with each other and neighbours would help each other with childcare? Maybe the grandma living next door could avoid the nursing home for a few more years because there would be people around her to help her out. Maybe we’d find community! Mid-life crisis? I hope not. I’d like to think of it as a mid-life passion. It’s a way of life that scares me and intrigues me all at the same time. It’s a culture shift that Winnipeg is slowly being introduced to and one in which our willingness to redesign the physical environment will be paramount. 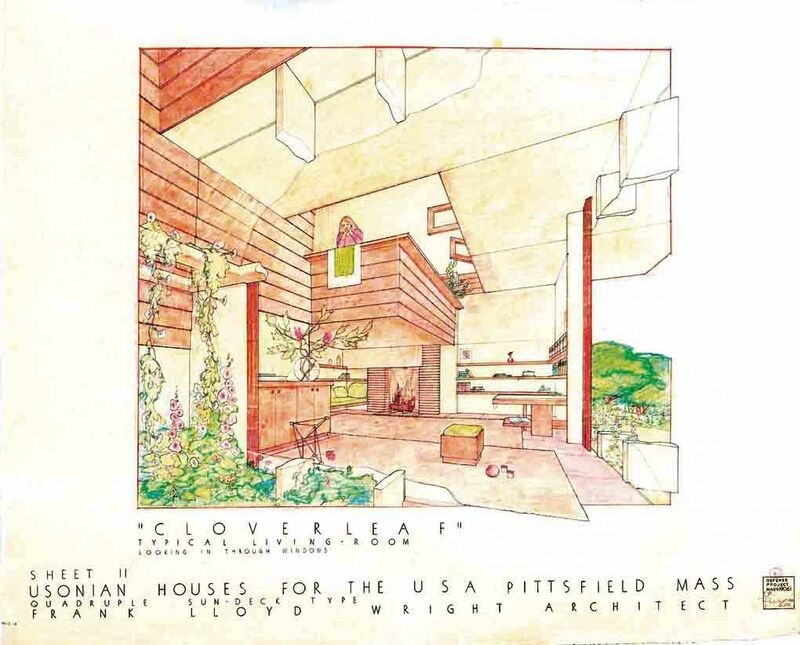 As someone who shed a single tear the first time I saw an original Frank Lloyd Wright perspective in person, I must admit I have a soft spot for hand-drawn renderings. There is something striking to me about the artistic quality of these perspectives that conveys the character of the work in a way computer generated images often lack. Maybe I don’t need all of the glossy details to get excited about design – I can feel the warmth and openness when I look onto the sketchy page. Call it Impressionism for Interior Design. That being said, I love using 3D programs and it has been an asset as we see our designs transform from concept to reality. Case in point – our latest completed work at the Winnipeg Airport; the Green Carrot Juice Bar. This is the second location for Green Carrot (the original is located in Osborne Village). We were quite excited to translate their branding scheme to a new kiosk location at the airport to attract busy travelers. The challenge was while working within tight spatial constraints, to maximize the efficiency of a safe and tidy workspace. Emphasis was placed on both employee workflow and flow of customer traffic around the order and pick-up areas, while encouraging patrons to relax and enjoy their juice while recharging themselves (and their devices) in the built-in power stations. The client desired an inviting, fun and fresh space. The finishes included glossy white tile, wood beams, and vibrant accents of green. Working in 3D allowed us the control to experiment with the design until we knew we had a stunning composition that would excite visitors and Winnipeggers alike! Next time you’re heading out of town, check it out and let us know what you think! For more photos of this project, check out our Commercial Gallery.